The original and best site for getting your name as a 3D Wallpaper, search for your name and see if its available as a wallpaper for you to download! How does it work - what is this website all about? 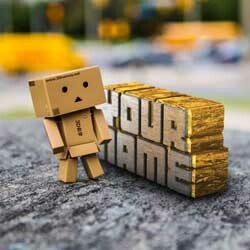 3D Name Wallpapers is a website that allows you to download thousands of different names in various styles of wallpaper. All you need to do is search for your name in the search box at the top of the page, and if your name is in our database of 84,419 names, then you'll see all of the various styles that you are able to download as a wallpaper for your mobile phone or your desktop/laptop computer. So get searching now, and download yourself a funky and original new wallpaper! Get the Promocode from Facebook - what does that mean? 3D Names are FREE to download, but the only way this website can stay alive is by making a small amount of money through advertising on it's pages. Every visitor that comes to visit this site helps to cover the daily running costs, so therefore all that is asked of its users is that if they would like to download their name in 3D then they help by sharing it with their friends by "Liking" our page on Facebook and getting the "Promocode"
Search for your name Choose from loads of styles Use as your Phones background Or use as Desktop Wallpaper 84,419 names to search from Get Now!